Sandi’s first pet was Millie, a Dachshund/terrier mix that her dad brought home one day in his pocket! Millie lived to be 18 years old! This started a lifelong love for pets for Sandi. Another pet, Tigger, was found in a boat, just days old. Sandi bottle fed Tigger and nursed him along. Sandi is retired from HP now. She and her husband are pet parents to former shelter residents Riley (Sandi claims she is the best dog in the world and perfect), and orange tabbies Rusty and Ramsey. 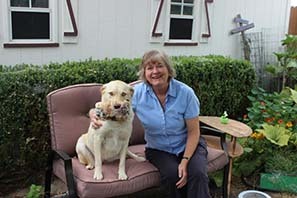 Sandi is a big believer in giving back and supporting animal non-profits in our area and is a familiar face at both Simply Cats and the Idaho Humane Society (IHS) where you might recognize her as a lobby greeter. Sandi loves animals and she believes Unconditional love is a true gift that pets give us – Total love. Sandi will often call The Pet Sitter, LLC office and ask how pets she cares for are doing because she misses them. Sandi loves other pet people because they can relate to her feelings about pets. Sandi loves connecting with each pet, finding out what they like, and spending one on one time with each pet. Besides pets, Sandi is also interested in plants and food. She is an advanced Master Gardener with Idaho State University, and is a Master Food Safety Advisor. We love having Sandi on The Pet Sitter of Boise team!